The public’s improving economic outlook is reflected in its policy agenda for President Trump and Congress in the coming year. Economic issues – improving the job situation, strengthening the economy and reducing the budget deficit – are viewed as less important policy priorities than they were just a few years ago. Other issues, which had been less prominent public priorities in the past, have grown in importance. The share of Americans saying that protecting the environment should be a top policy priority has increased 18 percentage points since 2010 (from 44% to 62%), and seven points in the past year alone. Also in the past year, the shares saying that improving the nation’s transportation system and dealing with drug addiction should be top priorities have increased 13 points each (both from 36% to 49%). A new national survey by Pew Research Center of 1,503 adults, conducted Jan. 10-15, 2018, finds that strengthening the economy continues to rank among the public’s leading priorities (71% top priority), along with defending against terrorism (73%) and improving the educational system (72%). However, fewer view the economy as a top priority than did so four (80%) or eight (83%) years ago. Over the same period, the share rating improving the job situation as a top priority also has declined; 62% say this today, its lowest point in a decade. In 2014, 74% viewed the job situation as a top priority and 81% did so in 2010. These shifts come as attitudes about the economy and jobs availability have become more positive. For example, the share of Americans who say there are plenty of jobs available in their communities increased from 10% in 2010 to 50% last month. 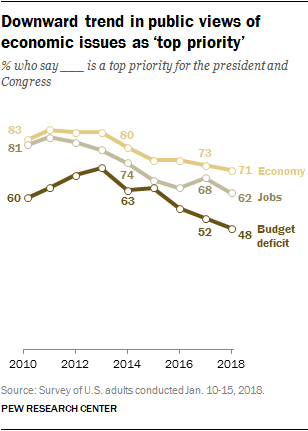 Reducing the budget deficit also has declined among the public’s policy priorities. Currently, just 48% say cutting the deficit should be a top policy priority for the president and Congress, down from 63% in 2014. A year earlier, in 2013, the share citing the deficit as a top priority was high as at any point in the past two decades (72%). Republicans and Democrats agree on the importance of some priorities. For instance, 68% of Republicans and Republican-leaning independents, and an identical percentage of Democrats and Democratic leaners, say taking steps to make Social Security more financially sound should be a top goal for President Trump and Congress. And there are no significant partisan differences in views of two emerging priorities, dealing with drug addiction and improving the country’s roads, bridges and public transportation systems. 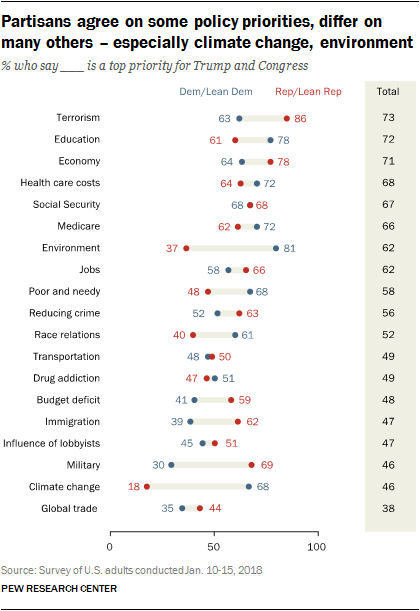 About half of both Republicans and Democrats say each should be top policy priorities. However, there continue to wide gaps about the importance of other policy objectives – especially dealing with climate change and protecting the environment. Nearly seven-in-ten Democrats (68%) and just 18% of Republicans say dealing with climate change should be a top policy priority. And 81% of Democrats say protecting the environment should be a top priority, compared with 37% of Republicans. There are sizable partisan differences on several other issues as well. Democrats are about 20 points more likely than Republicans to rate dealing with the poor and needy, dealing with race relations and improving the education system as top priorities. By contrast, more than twice as many Republicans as Democrats to say strengthening the military should be a top priority (69% vs. 30%). And while 86% of Republicans say defending against terrorism should be a top goal, a smaller majority of Democrats (63%) say the same. There is no overlap in the highest rated priorities for each party: Among 19 items in the survey, Democrats’ leading priorities are protecting the environment, improving education, making Medicare more financially sound and reducing health care costs. For Republicans, the leading goals are defending against terrorism, strengthening the economy and strengthening the U.S. military. Since Barack Obama’s administration, there have been declines in the shares in both parties who rate the economy and jobs as top priorities, with the changes somewhat more pronounced among Democrats. Today, 78% of Republicans and 64% of Democrats say strengthening the economy should be a top priority; in 2013, overwhelming majorities in both parties (87% each) said the economy was a top priority. That year, 81% of Democrats and 76% of Republicans also viewed improving the job situation as a top policy goal. Today, 66% of Republicans and 58% of Democrats say this. Throughout most of Obama’s presidency, more Republicans than Democrats saw deficit reduction as a top priority. That remains the case today. But since 2013, the share who says cutting the deficit should be a top priority has fallen more than 20 points among both Republicans (from 81% to 59%) and Democrats (65% to 41%). 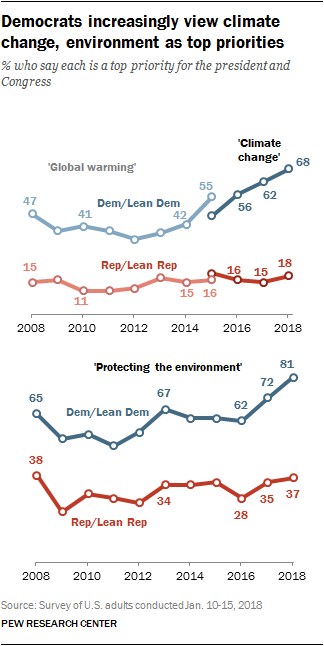 The shares of Democrats saying that dealing with global climate change and protecting the environment have increased substantially in recent years. By contrast, attitudes among Republicans have largely held steady. Nearly half of Republicans (48%) say dealing with climate change either is “not too important” or “should not be done” – by comparison, no more than three-in-ten in either party rate any of the other 18 issues as not too important or say they should not be done. More than twice as many Democrats (81%) than Republicans (37%) say protecting the environment should be a top priority for the president and Congress. The share of Democrats saying this is higher than at any point in the last decade and has increased nine points in the past year alone and 19 points since January 2016. Republicans’ views have shown less change over the last several years. In the past year, there have been marked increases in the shares of Americans who say dealing with drug addiction and improving the nation’s roads, bridges and public transportation are top policy priorities. Today, 49% say both are top priorities; 36% said this about each a year ago. The goal of addressing drug addiction has increased in importance among members of both parties. 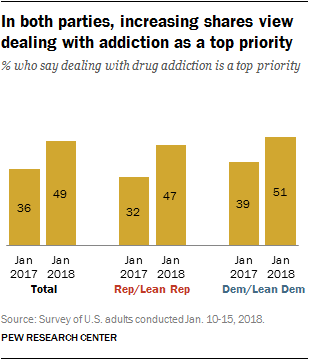 Nearly half of Republicans (47%) say that dealing with addiction should be a top priority; this is up 15 points since early last year, when only about third (32%) of Republicans prioritized this issue. Similarly, about half of Democrats (51%) say addressing drug addiction is a top priority for Trump and Congress, compared with 39% who said this a year ago. While the goal of dealing with drug addiction has grown in importance for members of both parties, there has been a sharp increase in the percentage of Republicans rating improving roads and public transportation as a top priority. Opinions have changed less among Democrats, who had previously been more likely than Republicans to view this as a top priority. 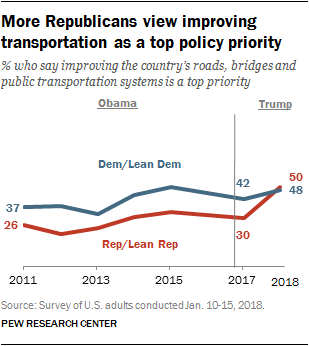 A year ago, 30% of Republicans said transportation was a top priority for Trump and Congress. Today, that share has increased to 50%. 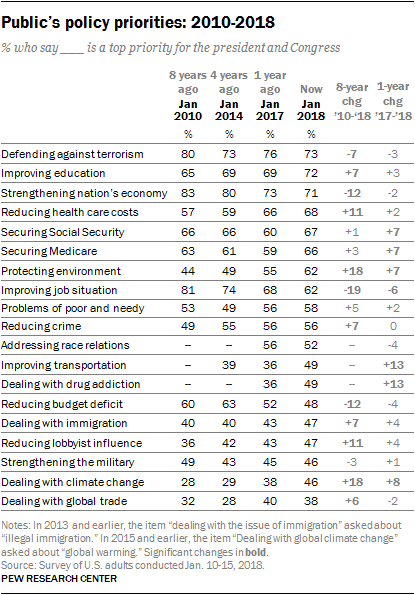 Among Democrats, 48% say improving the country’s roads and public transportation is a top priority, little changed from a year ago (42%). The policy priorities of young people and older Americans differ in several key respects. Older adults are significantly more likely to prioritize strengthening the military, making the Social Security system financially sound and dealing with drug addiction issues. While a 62% majority of those 65 and older say strengthening the military is a top priority, about a quarter (26%) of those 18-29 say the same. Adults 65 and older also attach greater importance than those under 30 to making the Social Security system financially sound (80% vs. 54%), dealing with drug addiction (64% to 40%) and reducing the influence of lobbyists and special interest groups in Washington (52% vs. 32%). Addressing global climate change is the only issue, among 19 included in the survey, which is viewed by significantly more people under 30 (56%) than those 65 and older (37%) as a top policy priority. Among those with no more than a high school diploma, 72% say that reducing crime should be a top priority, compared with 56% of those with some college experience and 37% of those with a college degree or postgraduate degree. A similar pattern is seen when it comes to improving the job situation: 73% of those with no more than a high school diploma give this issue top priority; the share saying this should be a top priority falls to 46% among those with a college degree or higher. Those with no college experience are more likely than those with a college degree or higher to say several other issues should be top priorities, including strengthening the military, dealing with drug addiction and strengthening the economy. Reducing the influence of lobbyists and special interest groups in Washington is the only issue that those with a college degree or higher prioritize more than those with no college experience: 53% with a college degree or more say this should be a top priority for the country compared with 42% of those with no college experience. There has been change and continuity in the public’s policy priorities over the past eight years. As noted, economic issues have declined somewhat in importance as the economy has improved. And the public has placed increasing importance on environmental issues. On several other issues – including reducing crime, securing the finances of Social Security and Medicare and dealing with the problems of the poor and needy – there has been relatively little change over time. Defending the country from future terrorist attacks has been among the public’s leading priorities for the past eight years. In fact, it has been a top public priority since 2002, shortly after the 9/11 attacks. On the other hand, dealing with global trade issues has been among the lowest-ranked priorities over the past two decades. However, in the last two years somewhat more Americans have rated this as a top priority (38% today, 40% in 2017) than said this in 2014.